I’m a consumer. I love buying and trying new things. 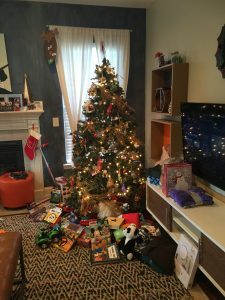 Because of this, I thought I would share some great gift ideas for the holidays that I have actually purchased and can recommend as “winners” for my kids! I know it’s hard coming up with new ideas. It’s even harder to buy children gifts when you don’t have any. Well, I do. I have two, in fact. They are both boys, and they play hard. They are also brutally honest. I know when they love something and when they don’t. I have put together ideas trying to include gender neutral options, but it will definitely be heavily accented with ideas that boys would probably like. This post is full of affiliate links. If you use my links to make purchases, you help keep Modern Day Fox going! Also, because it is full of links, you may have to press refresh to get the page to fully load. If you see a bunch of blank spaces, refresh! Pretend Food. What kid doesn’t love to play grocery store or house? Cutting Set – This one gets used A LOT. My three year old loves to pretend he is cutting things. Mmmmm. Pizza. Both my boys love pretending with this set! This set is a big hit at my three year old’s school, but we just don’t have enough room for it at home! This truck set was a gift to us and it gets used regularly by both boys. This is the play dough tools set. I highly recommend it. The tools are far better than the cheaper plastic ones you can buy. We play with these often! The Little People sets are always a hit! I don’t have this one, but my “girl mom” friends highly recommend! This is another I don’t have yet, but I love that it reminds the reason for the Christmas season! Balance bikes are great gifts for 2 and 3 year olds who cannot yet balance on a regular bike. My son got this when he was 2, but didn’t really start becoming interested in it until after his 3rd birthday. He is a pro on it now and rides it all the time. Razor Scooters – I don’t know a kid who has a scooter and doesn’t love it. Even though my three year loves to try to ride the Razor, this one is more equipped for him at this point. He is actually graduating from this to the Razor this Christmas, but doesn’t know it yet! A battery-operated car was their big present from a couple years ago. They play with this regularly. I recommend getting a two-seater if you have more than one kid, or they play with friends often. Otherwise, they will fight over who gets a turn. Well worth the cost and we have had no issues with it! I haven’t purchased this one- but oh my goodness, does it look fun or what?? My youngest son loves to get in a costume! Here are a few dress up costumes that could be fun gifts! I was really surprised at the quality of this costume. Size-wise, this fits an averaged sized three year old. My son is weeks away from turning four, but he still wears it. It’s just a little short on the bottom! I haven’t purchased this one, but I thought this princess costume was adorable! Pie Face was all the rage the last couple of years, but they stepped it up a notch. This one is on our Christmas list for this year, so I have no experience with it. I’m trusting that it is as fun as the original, or even better! This lounger is awesome. BUT, attention: This is just the COVER. Pillows are NOT included. We have a ton of pillows lying around so it was easy for us to fill it up. If you don’t, just buy 5 cheap pillows. The kids love laying on this thing and rolling it up and playing with it. I would definitely recommend putting the pillows in it before giving it as a gift. It’s not quite as exciting without the pillows. You may have seen me do a Live video on Facebook showing off this purchase. It’s so much fun!! Even the adults would have fun with this. It has bluetooth so you can do karaoke videos from youtube. Your phone clips into the front of it so you can see the words and sing along with the music as it comes out the speaker on the microphone. Ride-On Crane – This crane doesn’t have wheels, but it is so fun for the kids to sit on and dig in the sand, dirt or mulch. This is a very popular toy with the other neighborhood kids when they come over. My kids absolutely adore this roller coaster given to them by their aunt and uncle. It is easy to set up and easy to stack and store. My husband and I are only sad that we are just a little bit too big for it. Bounce House – Now this is a BIG gift both in price and in dimensions, but my kids have definitely gotten the value of it. This was a gift from their grandparents and it is a neighborhood hit! This size accomodates children 2-8. It blows up easily and deflates quickly. Folds into a bag for storage. Jungle Jumparoo – Maybe you saw this on Shark Tank. My mom and I did, and we knew immediately it was the perfect Christmas present. Now, listen. GET THE COVER. I repeat, get the cover. And, get the warranty. And, also, if it is not going to be in use for long periods of time (like during the winter), then deflate and store it. The tire can dry rot if you don’t take proper care. I had to replace the tire already. Even still, I think this play equipment is worth it because of how much my kids play on it – which is all the time. Jumbo Inflatable Ball – Full Disclosure – I paid considerably less for this ball as I found it at Aldi. It was the deal of a lifetime compared to what Amazon has them listed for. The kids had a blast with it until they tried to force it through the attic door and caught it on the door frame causing it to pop. If your kids are more careful than mine, I recommend this gift! This is one that I haven’t purchased, but I’ve been researching. STEM toys are great educational tools AND lots of fun for your little engineers! I bought an Amazon Fire in July for a killer price. Keep your eye on the Fires as they will likely go on sale again before Christmas! Both my kids really enjoy this story about mighty machines going to bed at night. My three year old is wild over this book. He loves the fun photos of food. Junie B – My son’s kindergartener teacher introduced us to these books. My six year old loved them so much at school that he begged us for this set. Julie B is a sparky little girl and lots of fun. Toys Go Out is the first in a series of three. We enjoyed reading these books together and learning about the secret lives of toys. The Chocolate Touch was a great story about a kid who learns his lesson the hard way about eating too much chocolate. My Father’s Dragon takes you on a great adventure. My son really enjoyed these stories. This is just a silly, fun book about classroom pets being terrorized by a squirrel that gets inside the school building. It’s a cute story! And, last but not least, since you know health and fitness is the name of my game… why not get a Beachbody All-Access Challenge Pack and try out the new Beachbody Family workout called Double Time? This is a gift for your family AND for you! One year access to over 40 different programs including Double Time streamed on Beachbody on Demand, a month of shakes, a ball for the workout, and a shaker bottle! This is the gift that keeps on giving. I’ve done this program with my kids and it is FUN!! Click here to learn more! I’m sure I’ll think of more items in the weeks to come and I will post a follow-up if I do! I hope this helps spark some ideas for your kid’s holiday gift list! Happy shopping!